Thanks for contacting us with your personal defense concerns, and we commend your drive to get as much insight as possible to enhance your personal defense plans. First lets address what I deduce is your main concern; how do you stop an attacker if he/she has enough adrenaline going or is jacked up on a substance such as pcp. Only an accurate headshot or severing the central nervous system will cause instant incapacitation of an attacker. This is documented by FBI research in U.S. Department of Justice, Federal Bureau of Investigation, Firearms Training Unit, FBI Academy, “Handgun Wounding Factors and Effectiveness” (Quantico, VA, July 14, 1989); furthermore, absent a headshot multiple fast torso hits are required to stop an attacker. This is documented in a five year study on real police shootings made by “Police Marksman Magazine” titled, “Stopping Power”. This is why focusing on weapon and ammunition selection should not be your main emphasis. Instead one should focus on taking a personal defense shooting program which teaches techniques to deliver accuracy, multiple, fast hits on target. There is also a great deal of myth and folklore out there about projectiles from handguns, shotguns or even hunting rifles knocking people off their feet. These are totally false. I interviewed several people who shot attackers with all calibers of handguns and even .223 caliber/5.56 rifles, and they all said none of the rounds knocked the attacker off their feet. I even saw a video (VHS titled: “Deadly Weapons and Firepower”) of a man who wore very high threat level ballistic body armor, when he got shot with an “FN FAL” .308 caliber/7.62 rifle, while he was standing on one foot. This man never moved from the impact of the bullet. So, “00” Buck shot won’t knock anyone down, if they are or are they are not on “…adrenaline or is jacked up on a substance such as pcp”. Now as for the man’s statement, I don’t know, if the claim is true. Did the person who made the statement actually show a video to support his statement or was he making a statement based on what he was told by someone else or what he thought was true? Furthermore, did they give you a distance at which the Bird Shot was tested? These distinctions are very important, especially since your life may very well depend on it. There are lots and lots of myths and folklore out there, when it comes to personal defense firearms, techniques and ammunition, and lots of people continue to make statements based on those myths and folklore. We stay away from untested or disproved myths and folklore. We personally test our recommendations or we research the documented facts and use scientific evidence, before we make our recommendations. This is what makes us different from other so called personal defense training providers. First of all we do not recommend a shotgun for personal or home defense use. If someone decides to use a shotgun for home defense, we recommend Bird Shot for effective incapacitation and limited over penetration concerns. The average inside home defense shooting distance (from end of the barrel of a shotgun to the target) is about 10 feet. Bird Shot has an average of 650 to 700 separate pellets in every shell at a weight of about 1 1/8 to 1 1/2 ounces (as written the box). I personally fired factory Bird Shot out of an 18” barrel tactical, 12 gauge shotgun at 10 feet and the pellet pattern is about 2 inches in diameter. At that distance the velocity of the pellets (listed on the side of the box) is about 1300 ft. per second. At that distance, with that tight a pattern, along with the combined weight and velocity of the pellets, the scientific facts substantiate our belief that the kinetic energy created will penetrate the human skull or more than 2 inches of “muscle on the human body”. Bird Shot also has less felt recoil for enhanced controllability. This controllability gives the shooter the ability to fire multiple follow up shots on one attacker or multiple attackers if needed. Now when it comes to over penetration concerns inside the home, we recommend Bird Shot. Inside the home over penetration can endanger those persons in adjacent rooms, and if you live in a tightly packed residential setting, it could endanger your next door neighbor, if the pellets go through and exterior wall and hit someone outside or in the adjacent home. As the Bird Shot pellets begin to spread out there is no longer a combined weight to enhance penetration. Instead the kinetic energy is reduced down to only the weight of the individual pellet. This greatly reduces the pellet’s penetration. I fired Bird Shot at 21 feet out of an 18” barrel tactical, 12 gauge shotgun and the pattern starts to spread out, so beyond that distance the penetration effect of Bird Shot has greatly reduce lethality. Therefore, when it comes to home defense concerns, Bird Shot gives you the best of three worlds, good close distance penetration for personal defense, reduced recoil for more multiple shot control, and less penetration to reduce collateral injury and damage. 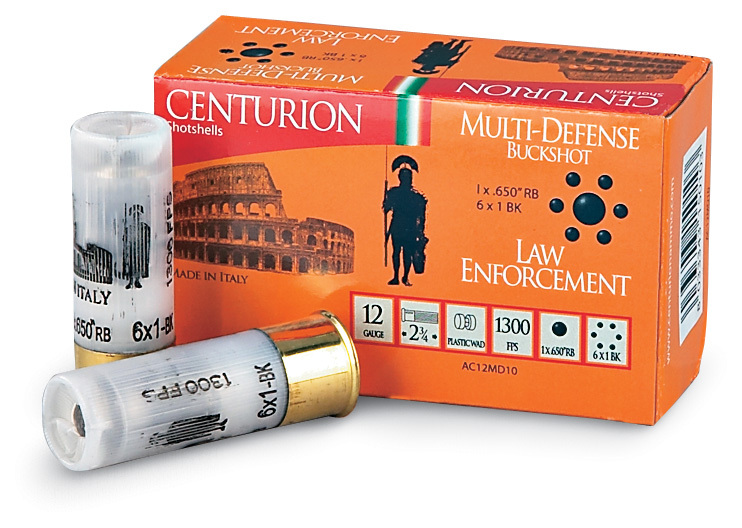 Whereas, the same projectile weight of a “00” Buck Shot shell contains nine .33 caliber pellets. This means, when the pattern begins to spread, the kinetic energy created by each individual pellets has a much greater potential for over penetration into an adjacent room or in a tightly packed residential setting. Finally, the myth and folklore of “Knock down power” is false. In a real world shooting situation, caliber as well as bullet type and design, in and of themselves, will not stop an attacker. Only head shots will cause instant capacitation. Absent a head shot multiple, fast torso hits will cause enough internal organ damage to stop an attacker. Our main focus must be on obtaining personal defense firearms training which teaches techniques to delivering up close headshots or fast, accuracy, multiple, well placed follow up torso hits.